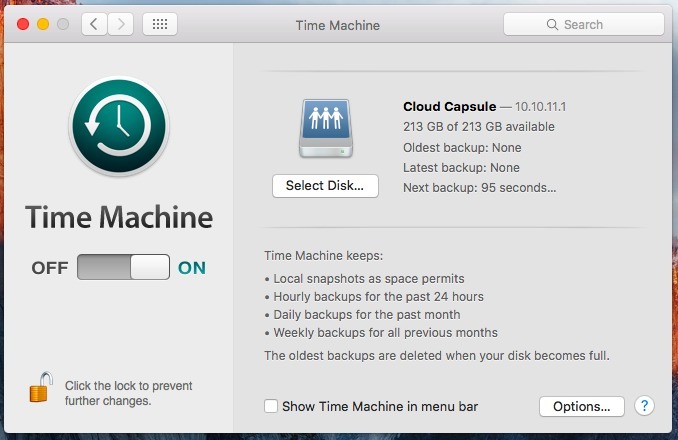 OS X’s Time Machine is a fabulous backup solution for Macs. But it relies on you dragging your Mac “back to base”, either by plugging into a USB disc or to an expensive Time Capsule. This guide will walk you through configuring Time Machine to backup to a cloud server in just 20 minutes. By doing this, the backup will work from anywhere where you have an internet connection, and you won’t have to worry about hardware maintenance. A Linux-based server running a Virtual Private Network (VPN). Your server allows Time Machine to communicate securely over the internet and provides storage for your backups. if you don’t already have a server, you can read more about what exactly you need below. A Mac OS X machine from 10.7 (Lion) onwards. A ‘fast’ upstream internet connection. We recommend that you ensure your Mac can connect with at least 10Mbps upstream. You can use the same server to back up several Macs, and Time Machine’s data encryption means that your data is safe even if you’re sharing one. You don’t need an expensive server – a £10/month cloud server from Bytemark will do the job. You’ll need your own Linux-based server to follow this guide. You’ll need to understand how to use SSH to run commands, and to edit files on it. 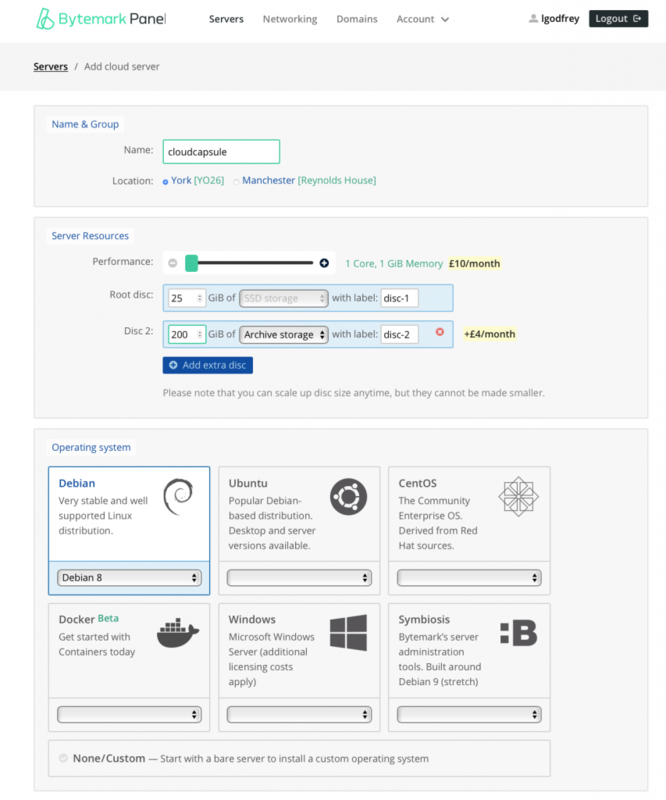 You can sign up to Bytemark’s cloud servers in about 5 minutes – they’ll let you expand your storage as you need more. We’d suggest you start with twice as much storage as you’ve used on your Mac, to allow for plenty of backup history to build up. So e.g. if you have 100GB used on your Mac, start your server off with 200GB storage space. You can then click “Add this server” and your server should be created for you in about five minutes. Here’s how to set them all up before we start installing software, and so you can write them all down at once. It’s really important that you do write these passwords down and keep the record somewhere safe, otherwise you may find yourself unable to restore later. Your secret will be printed out at the terminal, make sure you write it down and file it away. You can decide your own VPN login password; it’ll prompt you for that next. But if it’s not a password you’ll remember, write it down and store it somewhere safe. We need to install Netatalk, but it needs building from source which takes a few minutes. Netatalk serves up a remote disc to your Mac, and Time Machine connects to it. You should get a response from the system confirming that “afpd 3.1.9 – Apple Filing Protocol (AFP) daemon of Netatalk” is installed. 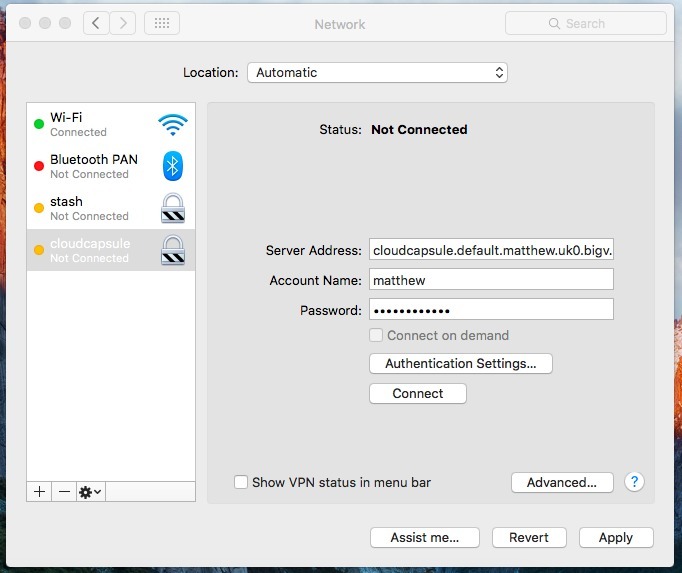 On your Mac, open System Preferences and go to the Network panel, then click the + button at the bottom left to add a new network connection. Finally press Apply in the bottom-right, then Connect. Your VPN is up, you can close the Terminal window and proceed to the next step. As things stand, you have a working VPN. But every time you turn off your computer or change its network connection, it stops until you start it again. You can do this manually if you prefer, and if you forget, Time Machine will eventually complain that it can’t back up. But you probably want to make it connect automatically. 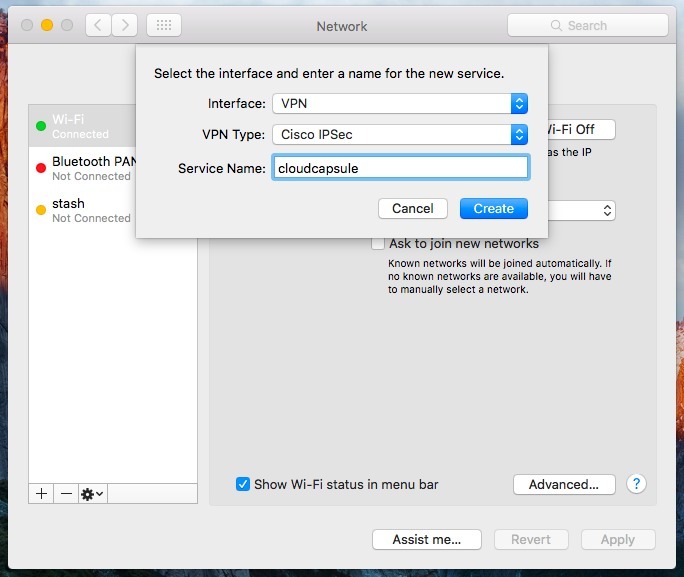 You can test that it works by Disconnecting your VPN from the Network Preferences panel, and observing that within a minute, the connection re-establishes itself. Assuming it comes back and tells you its “active (running)”, usually in green, your server setup should be finished. Back on your Mac, you can now connect to your server. Click on the Finder (left-hand side of the dock), and press ⌘+K to connect to your server. When that works, you should see an empty folder open – that’s your home directory on the server, which we don’t need, but proves that the connection is working, and that we can set up Time Machine. Now that you have a connection to your server, you can set up Time Machine. You’ll need to do this from the Terminal again, so hit ⌘+SPACE and enter Terminal. sudo tmutil setdestination "afp://(your VPN login name):(your VPN password)@10.10.11.1/Cloud Capsule"
sudo tmutil setdestination "afp://matthew:shazam@10.10.11.1/Cloud Capsule" # EXAMPLE WON'T WORK! 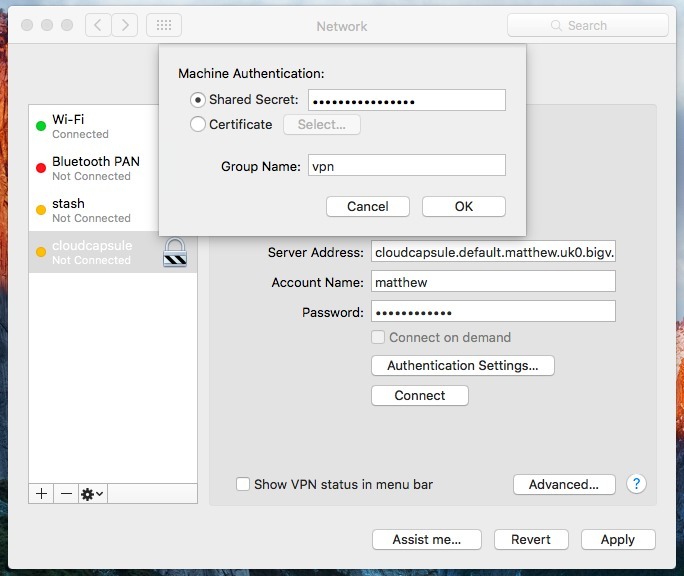 OS X will ask you to enter your Mac password to confirm this command. There’ll be a pause of 10-20s, and it will come back to a prompt without a message. If you now open System Preferences and go into Time Machine, you should see “Cloud Capsule” as the backup destination. You should now be able to follow Apple’s instructions to start your first backup. Step 9: Make sure that first backup completes! The backup speed is completely dependent on your upstream internet connection, which is often a lot less than your downstream e.g. you might get 24Mbps downstream, but only 2Mbps upstream. If you have a 2Mb upstream internet connection, and 80GB of data to back up on your computer, it will take 5 full days to upload. So if you have a lot of data, you might want to take your Mac to a faster internet connection temporarily to get it done. Unfortunately Time Machine won’t be able to back up over our VPN during Power Nap. Once the first backup is complete, you should find subsequent backups are much easier on your connection.